In Ancient times the royal families not only used Ayurveda to cure ailments, but also used them as a means to maintain their health and build up immunity and strength. One such form of special Ayurvedic treatment was Pizhichil. Pizhichil massage ayurveda Treatment is a type of Ayurvedic Massage which combines two modes of therapies, i.e Oil therapy and heat therapy. It is a mild and coordinated body massage, which is done with constantly flowing warm medicated herbal oil. Thus, it combines the goodness of both oils and heat. When medicated oil is massaged, its healing elements are directly absorbed in the body through skin. The massage enhances the blood circulation and thus helps to balance mind and body. Heat Therapy is known to relieve pain and relax muscles. It is highly recommended for extremely high Vata dosha types. The word Pizhchil means Squeezing. Pizhichil massage ayurveda treatment is a type of Sarvanghdara. 'Saravanga' means the whole body and 'dhara' means the stream. In Pizhichil massage, the oil is squeezed from a cloth dipped in a bowl of warm oil on the whole body of the person receiving massage. The first step in the process of Pizhichil massage ayurveda treatment includes the application of oil on the head and whole body of the individual receiving the massage. 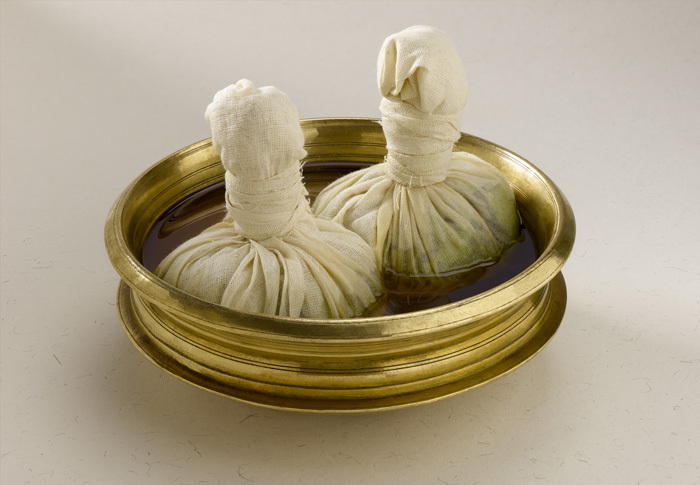 After that a cloth is tied over the head of the individual to prevent oil poured entering into eyes. The ingredients of ayurvedic oil used in the treatment are based on the medical condition of that individual. Before starting the treatment, the ayurvedic oil is first warmed. The massage usually starts with the oil being poured over the patient’s shoulders. The person who massages squeezes the oil in one hand and gently massages on the area the oil is poured with the other so as to help in absorption of oil to the body. The massage is given rhythmic and synchronized motion so that no part of the body remains untreated. Sometimes, along with Pizhichil treatment, Shirodhara is also performed, which refers to the uninterrupted pouring of oil on the forehead( the third eye). Although sweating is a part of the Pizhichil treatment, special care is taken so that the person does not sweat over the head as it cause the patient to catch cod. After the massage the patient is taken for a warm water bath for the body and lukewarm water bath for the head. This process is usually done one time a day. Pizhichil treatment is very helpful in treatment of diseases like arthritis, osteoarthritis, hypertension, asthma, and can also cure diabetes and tuberculosis at the early stages. Quick healing of bone fractures.